This is a personal account, that you may well find interesting and informative. I have been giving Tarot Readings to humans for quite some while now, but it was only in the last few weeks that I started giving readings to Animals. My cat to be precise. This happened by way of learning Animal Communication, from Pea Horsley of Animal Thoughts. I originally contacted Pea, when I asked her to write an article on Animal Communication, for a Newsletter on another site of mine. I later asked for her help communicating with Vlad, a cat of mine who was dying. After the whole experience, I decided that I really needed to learn how to do this myself and organized an Animal Communication Workshop with Pea, here in West Cork. “I believe we are all ‘gifted’ and able to communicate with animals, because we are all intuitive. Animal communication is simply intuitive communication with animals. As children we were more open to all forms of communication rather than simply relying on the spoken word and we were more truthfully in touch with our heart and able to express ourselves using all our senses – intuition. As adults we can tap back into this way of being and heighten our sensitivity once more. So in effect, communicating with animals is another way of using and developing our inherent intuitive faculties. Not so very dissimilar to doing Tarot Readings. I also drew a few cards for him, before her communication (about five weeks ago) see below. 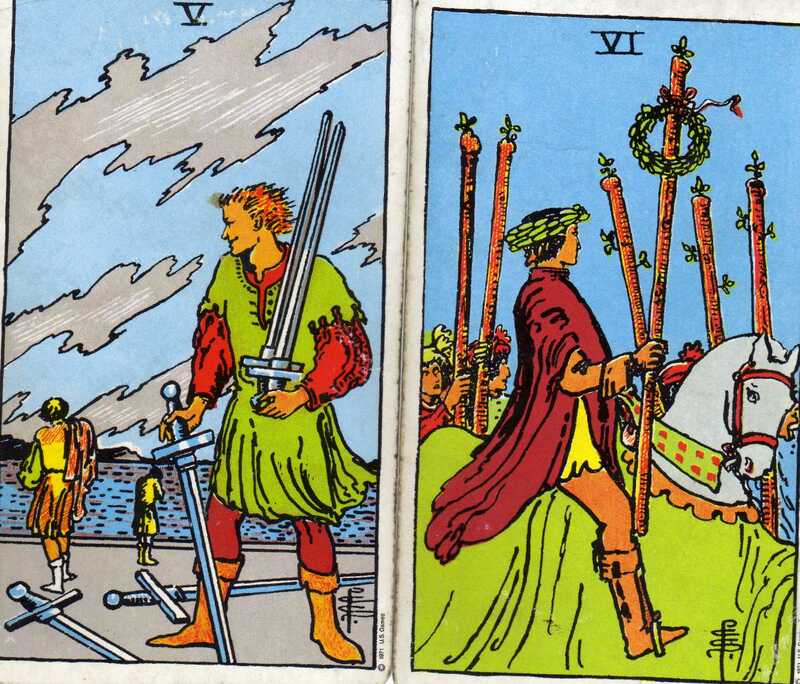 The card on the left the Five of Swords, was in answer to; ‘How are you feeling physically now, Ginge?’ I interpret this as; ‘Defeated, reaching the end, in pain, leaving, ready to go’. The second card on the right the Six of Wands, was in answer to; ‘How are you feeling about moving into Spirit, Ginge?’. I took that to mean; ‘Really, very good’, Victory no less! Physically he said he was in very bad shape and in a lot of pain and at that point, he wanted to ascend in five days time, during the Disseminating Moon. Pea told me, that he felt very good about moving into Spirit and for me not to worry about him. He smiled as he said he was going to; ‘Join the Cats’ and be ‘King of the Cats’. On the day of the Disseminating Moon, Pea talked to him again and he said he didn’t want to leave that day, because it was too cloudy. So as I write this, we are waiting till the next Disseminating Moon, on the 25th November, to see if he wishes to Ascend then. Meanwhile, I have been giving him lots of attention and healing and he seems much more contented in himself, he has come out of his ‘Misery Box’ (a cardboard box in the spare room) and is being sociable and purring a lot. 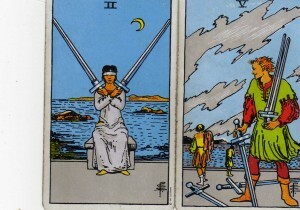 The left card the Two of Swords was drawn in response to my question; ‘How are you feeling within yourself now, Ginge?’ My interpretation of the card; ‘Still in pain, waiting, going within, being patient and I thought, undecided about leaving. 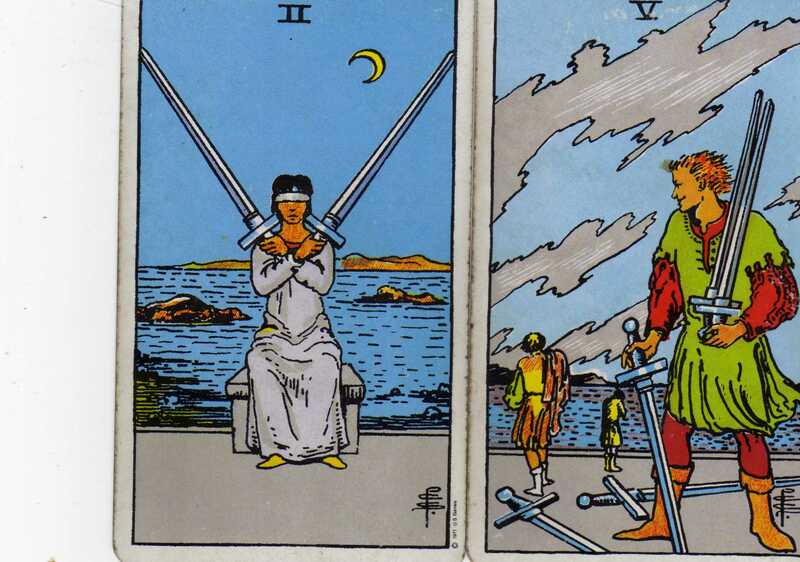 However the other card, the Five of Swords drawn in response to the question; ‘Do you want to leave on the 25th still Ginge?’ I take as a definite ‘yes’ to still wanting to Ascend then. Since then, I am giving Ginge lots of healing, spending much time with him, loving him as much as I can, treating him like a King and calling him King Ginge! If you would like to learn more about how to develop and use your intuition, click here to subscribe to the bi-monthly Intuition Development Newsletter ‘INTUITIVE’. 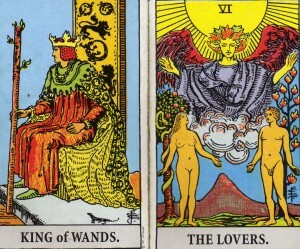 Each subscriber is automatically entered into a draw for a Tarot Reading, the winner will be announced in the Newsletter.